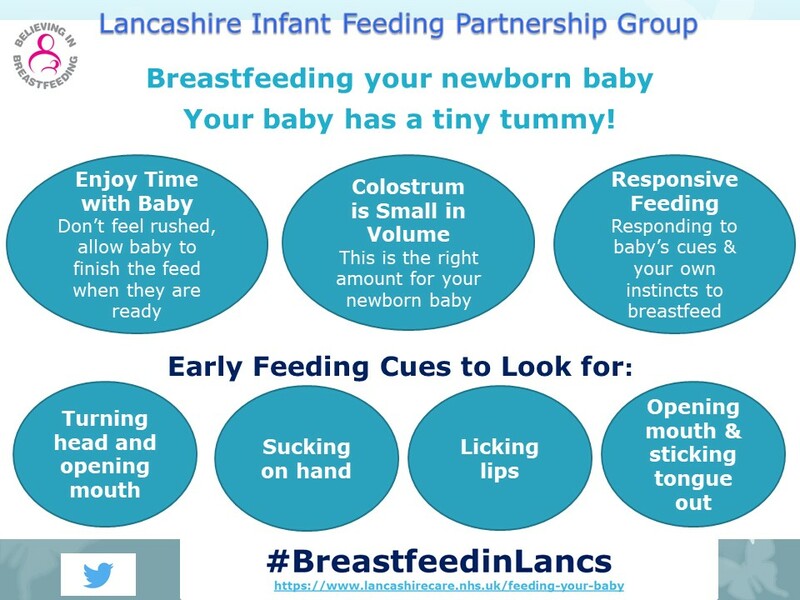 This year, the Lancashire infant feeding leads have been working on a co-ordinated programme to celebrate breastfeeding across the county in the week 24th to 30th June. As it happens, this coincides with the recently announced Public Health England Breastfeeding Celebration Week, 25th to 29th June. 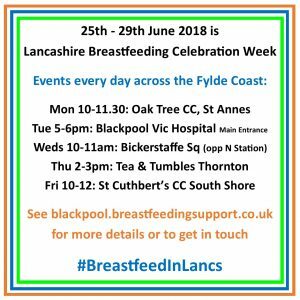 If you would like to know more you can find the Blackpool Fylde & Wyre Breastfeeding Support Facebook page HERE or contact us via the form below. 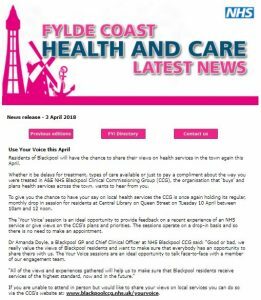 Residents of Blackpool will have the chance to share their views on health services in the town again this April. Whether it be delays for treatment, types of care available or just to pay a compliment about the way you were treated in A&E, NHS Blackpool Clinical Commissioning Group (CCG), the organisation that ‘buys’ and plans health services across the town, wants to hear from you. To give you the chance to have your say on local health services the CCG is once again holding its regular, monthly drop in session for residents at Central Library on Queen Street on Tuesday 10 April between 10am and 12 noon. The ‘Your Voice’ session is an ideal opportunity to provide feedback on a recent experience of an NHS service or give views on the CCG’s plans and priorities. The sessions operate on a drop-in basis and so there is no need to make an appointment. Dr Amanda Doyle, a Blackpool GP and Chief Clinical Officer at NHS Blackpool CCG said: “Good or bad, we really value the views of Blackpool residents and want to make sure that everybody has an opportunity to share theirs with us. The Your Voice sessions are an ideal opportunity to talk face-to-face with a member of our engagement team. If you are unable to attend in person but would like to share your views on local services you can do so via the CCG’s website at: www.blackpoolccg.nhs.uk/yourvoice. To mark the end of the Star Buddies contract in North Lancashire, this ‘memory box’ video was put together to celebrate the achievements of all Star buddies across Blackpool and North Lancashire over the past 10 years. You will be missed, ladies! 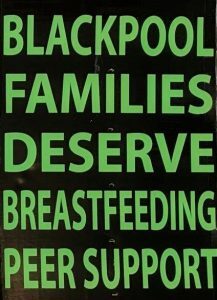 Today marks 6 months since this campaign met with the commissioners at Blackpool Public Health, to warn them about the potential consequences of ending the breastfeeding support project in Blackpool, and to urge them to reconsider their decision. In that time we have met with both of the Blackpool MPs, we have spoken at a meeting of the elected representatives of the council, our campaign has been discussed in the House of Commons, we have met with the leader of the Council and other council representatives, and we have had messages of support too numerous to count. Many positives. 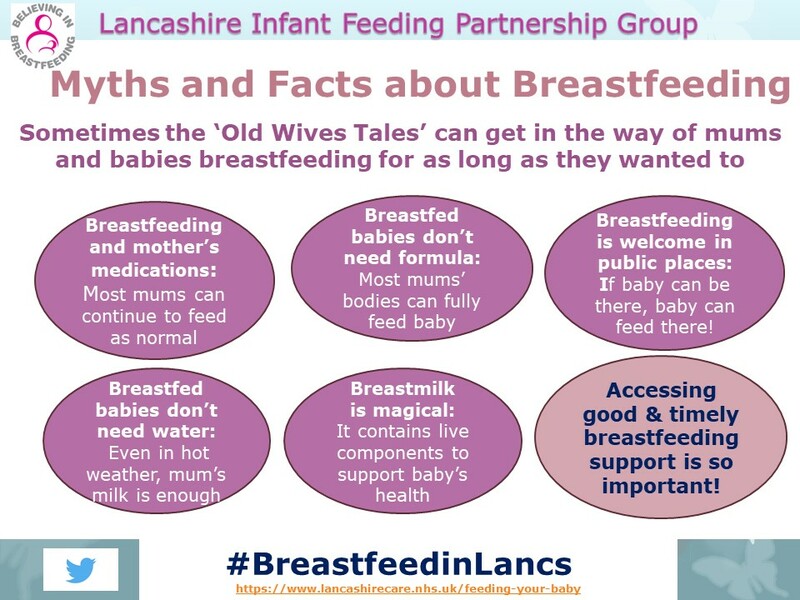 However we have also heard and continue to hear many harrowing stories of families in Blackpool whose early feeding journeys have been blighted by the lack of available appropriate breastfeeding support. In our opinion this is not acceptable. And so we continue to work hard, behind the scenes, to ensure that all levels in the council understand what it is that Blackpool is currently missing. We do not blog here about every single meeting or conversation because we have felt that movement from Blackpool Council was in a positive direction. However, it has now been six months since that first meeting, with our next meeting scheduled for the new year when it will have been a full seven months since the end of the breastfeeding support project, and still we seem no nearer to our objective of reinstating some kind of breastfeeding peer support programme for the families of this Town. 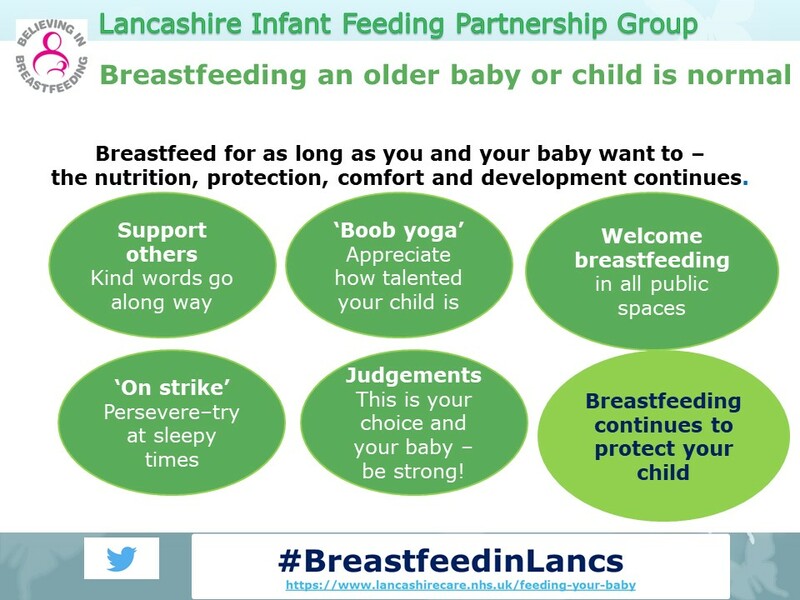 Today we have once again been told that in the Council’s opinion, Blackpool families do not want a breastfeeding peer support service, and so we ask that those of you reading this in Blackpool who would like to share your views on the subject, complete our form, here. 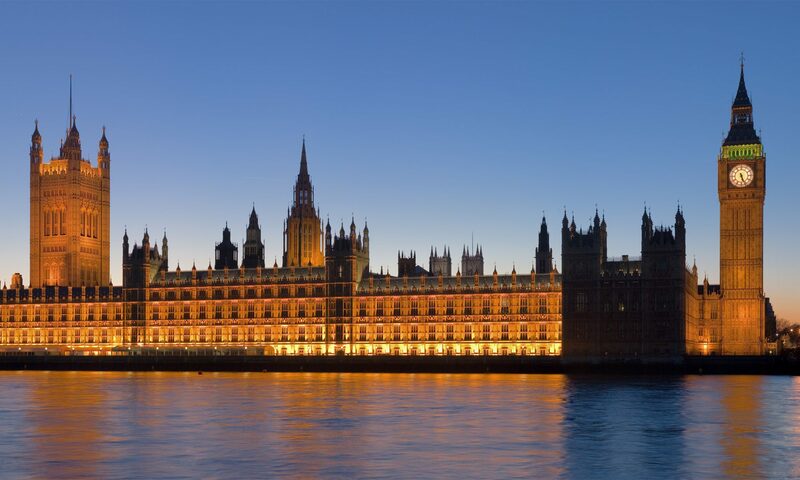 The plight of the infant feeding support services in Blackpool was raised again at the All Party Parliamentary Group on Infant Feeding and Inequalities at the Houses of Parliament this week. 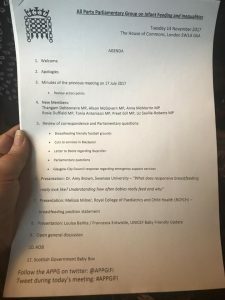 It was first mentioned at the July meeting, and this prompted the visit in September from MP Alison Thewliss, and the offices of MPs Paul Maynard and Gordon Marsden, already reported here. As this issue continues to be a concern at the highest levels, this campaign will continue to fight for an infant feeding specialist role in Blackpool, supported by a team of well trained and well supervised breastfeeding peer supporters. As we have further updates to share, you will find them here! 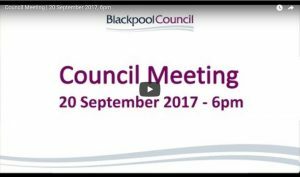 As requested by the Leader of Blackpool Council Simon Blackburn after resident Zoe Walsh’s representation to the Full Council meeting on Sept 20th, a meeting was arranged between this campaign and the council, including Public Health. This meeting took place on Monday 9th October at Bickerstaffe House (pictured) and included a discussion of the points raised in the speech made on 20th September (which is included here with links to the evidence cited Council talk 20th Sept 2017 – annotated) as well as some finer details and larger discussions. 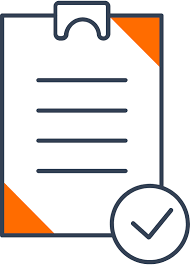 Following the meeting we have agreement to proceed with a request for the council’s scrutiny committee to look at the decision that was made leading to the ending of provision on June 30th. 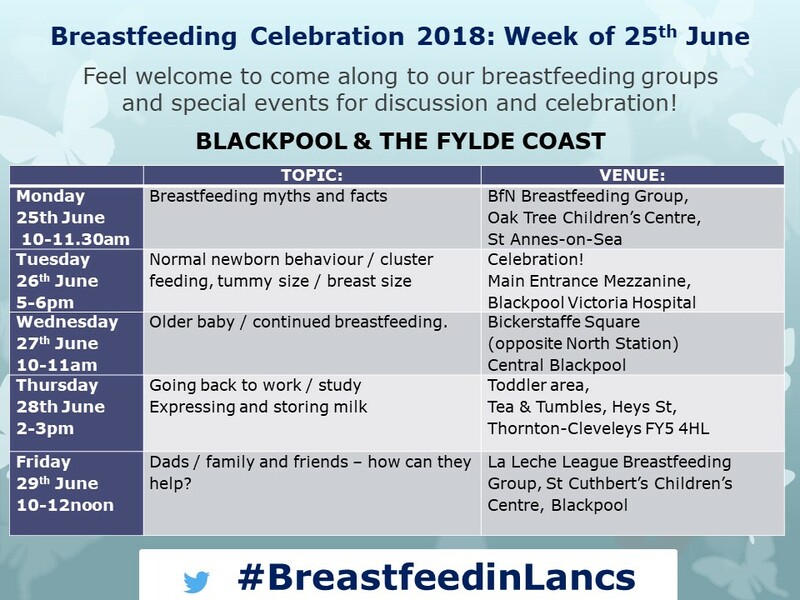 We also have a commitment to look at how breastfeeding peer support and infant feeding strategy should look in Blackpool in the short and longer term, and have been invited back to discuss this further at a later date. 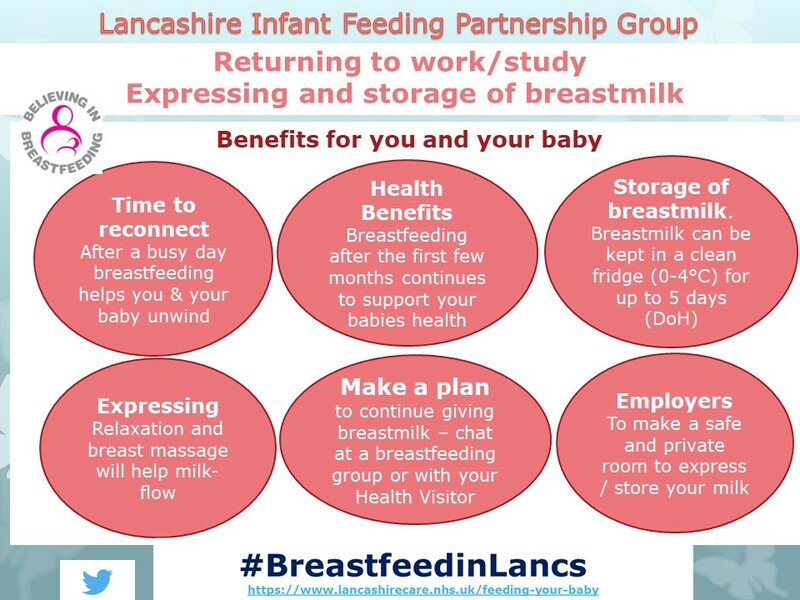 If you would like to get in touch with the campaign to fight for appropriate breastfeeding support services in Blackpool, you can email blackpool@breastfeedingsupport.co.uk or contact us through our Facebook group. 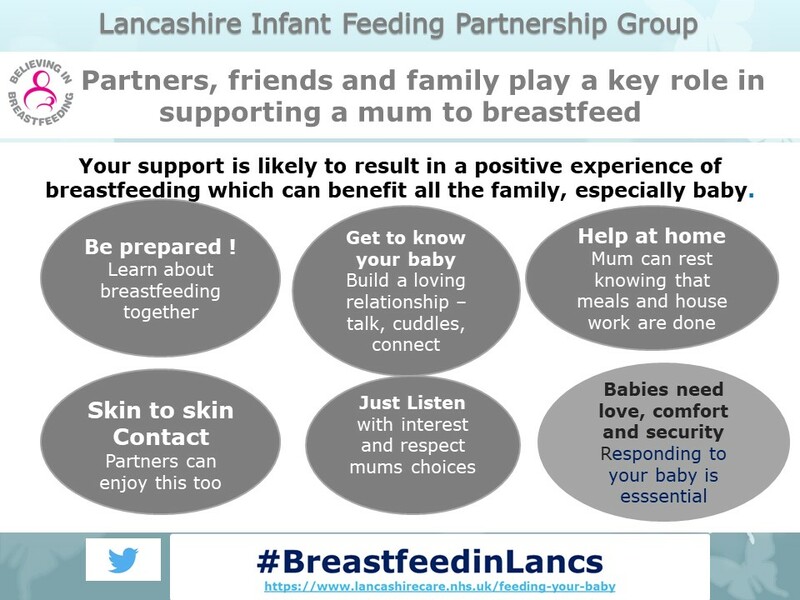 Here’s a page with the details on how to access breastfeeding support and information locally. 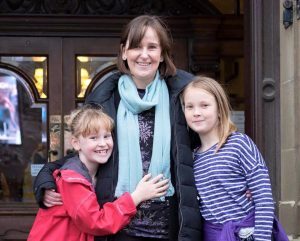 Co-founder of the campaign Zoe Walsh, outside Blackpool Town Hall with her daughters. Zoe was herself a recipient of Star Buddy support after the birth of both of her daughters, and went on to train as a breastfeeding peer supporter herself. 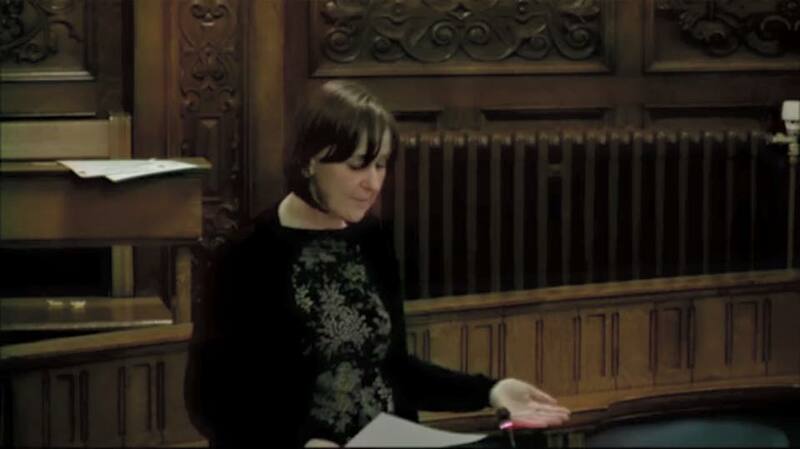 On the 25th May 2017, around a month after hearing about Public Health Blackpool’s decision not to renew the funding for the Infant Feeding Lead and the Star Buddies Breastfeeding Peer Support programme (funded in various guises to this point for around 12 years), this campaign’s co-founder Zoe Walsh applied for a slot to present at a Blackpool Council meeting (to the elected representatives). We waited for a date to be sent to us, and enquired in June to find that we had been missed off the list and, because of the Extraordinary Meeting in July and the Summer Recess in August, would now not be able to present until the September Meeting, long after the Star Buddies project had been ended and the individuals working in the programme had been forced to move on with their lives and into other jobs, leaving Blackpool with no breastfeeding peer support service or infant feeding lead for the first time in 12 years. We were told that this would be a 5 minute space to speak in, with no debate, and no discussion, simply a pre-written response read out at the end, but that it was the correct forum to raise this with the elected representatives of the council, who effectively control the council’s Public Health department. In the council chambers there is a public gallery, and we let people know ahead of time via Facebook and this website that they could attend so that we could have that gallery filled with lots of faces of people nodding their approval of the speech. We began to write a speech and soon found that 5 minutes is not nearly long enough to explain the ways that the Infant Feeding Project was previously meeting many of the requirements of the Council, and in order to squeeze the really vital material into the time, we had to miss out a lot of the statistics and the evidence base. We are planning to provide an annotated version of the speech, with links to the evidence, here in due course. If you just cannot wait, there is already some information about our case here. On Wednesday 20th September, Zoe was finally able to make that presentation to the council, and the front row of the gallery was indeed filled with spectators nodding their approval of the speech. 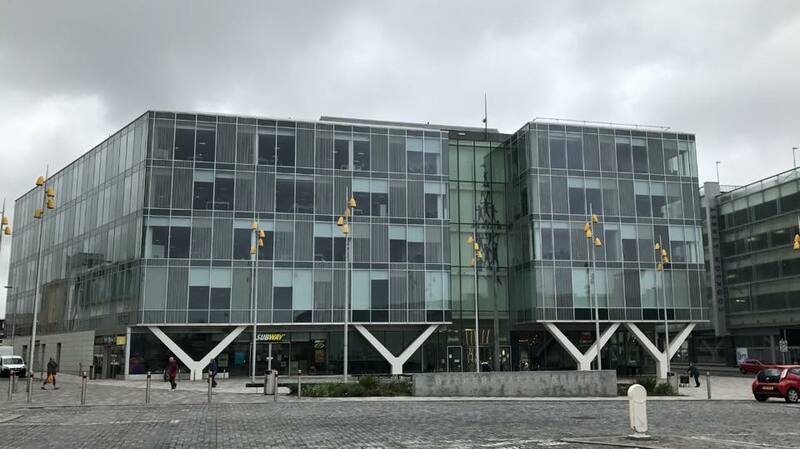 As it happens, the elected representatives were also pleased to hear the speech and Zoe was approached by a number of councillors after the meeting, offering contact details and asking for more information. There’s a clip of the speech, and the council’s reaction to it, viewable on the council’s website from about 4m30s or via the clip we have put on youtube, below. “Ms Walsh has said a number of things that I don’t think we have taken sufficient account of, so rather than give the response that we had, I’d like to offer a meeting“ between this campaign and both Cllr Blackburn and Cllr Cross, as well as the Director of Public, who had come into the meeting just before it began and was there to hear the speech, and to later receive a printed copy of the petition we ran earlier in the year – now amounting to 54 printed A4 pages of signatures and comments! If you have not signed, please feel free. We are in the process of finding a mutually suitable date, as councillors and campaigners have actual jobs in addition to their community work! We will keep this page updated. Pictured R:L – Gill, from MP Gordon Marsden’s office; Kristie Legg, local mum, N Lancs Star Buddy and previous Blackpool Star Buddy; Liz Nuñez, local mum, previous Infant Feeding Lead and Peer Support Co-ordinator for Blackpool community; Zoe Walsh, local mum, Doula and campaign co-founder; local mum and mum-to-be Caroline; Alison Thewliss MP, chair of APPG IFI; Local mum of 2 Dani; Paul Maynard MP; Shel Banks, local mum, Infant Feeding Specialist and campaign co-founder; Loreto Iglesias, local mum, La Leche Leader and Chair of the Blackpool Maternity Matters group. 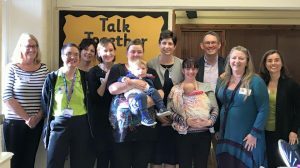 On Tuesday 19th Sept Blackpool was fortunate to host a visit from the Chair of the APPG for Infant Feeding and Inequalities, MP Alison Thewliss, who came down from Glasgow with her assistant Graeme to meet some Blackpool families with our Blackpool MPs. Big thanks are due to Paul Maynard MP and his assistant Rob for attending, and to MP Gordon Marsden who, while unable to attend the meeting himself owing to commitments in Westminster, WAS able to send Gill from his office, who was great. Two hours of discussion, lots of learning, hearing stories and other information about the infant feeding and peer support service over the past 10 years, and the loss of that service. * awareness of this issue has reached Westminster and the Chair of APPG was sufficiently concerned to come and speak to local MPs and residents. * the absence of an infant feeding lead for Blackpool now (commissioned with the peer support service) means there is no one for community staff to refer issues to, or to train the staff in breastfeeding OR formula feeding management, or to resolve issues around medications and breastfeeding, or unsafe preparation of powdered infant milk, or the rights of babies to be breastfed wherever they are, or the legal and social responsibilities of Blackpool businesses and employers to young families – no one tying the threads together to work for the greater good of the population here. 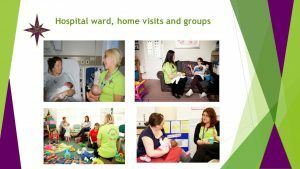 * it was obvious from hearing the mothers speak that visits and contacts from peer supporters, and the availability of breastfeeding groups in the community, reduced much of the social isolation they felt in the early days , weeks and months of motherhood. Good to “talk together” as the poster says – but more action needed going forward. 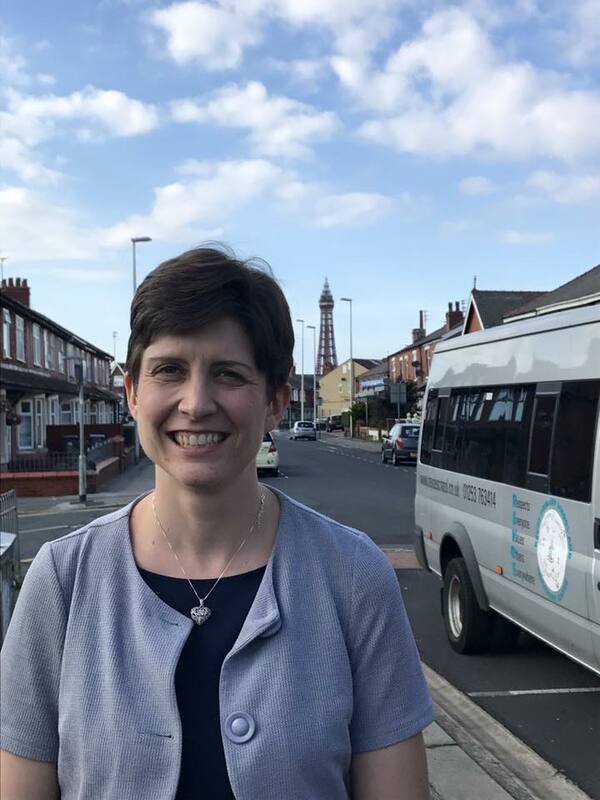 MP Alison Thewliss pictured here at Revoe School in the country’s most deprived ward, Bloomfield in Blackpool, after the meeting. September updates – and ways to get involved! We have two events coming up NEXT WEEK at which we would welcome the attendance some of you, and for you to share your support of! Firstly, on the afternoon of 19th September, the chair of the All Party Parliamentary Group for Infant Feeding and Inequalities MP Alison Thewliss, is coming to Blackpool, to meet with Blackpool MP Paul Maynard, and hopefully also Blackpool MP Gordon Marsden – although at time of writing we have not received his commitment to attend – to discuss the loss of breastfeeding peer support and the infant feeding project in the town. This will be at Revoe Children’s Centre, Grasmere Rd, Blackpool FY1 5HP between 2 and 4pm on Tuesday 19th, and all Blackpool residents, particularly families affected by this loss, then please join us – and it would be good if you could let us know you are attending, below – thank you. If you are a Blackpool South resident, ie if Gordon Marsden is your MP, it would be great if you could contact him to ask him to attend the event so we can have full cross-party discussion of the issues with accessing breastfeeding support for Blackpool residents. Secondly, Zoe Walsh Doula will be addressing the elected representatives of Blackpool at a full Council meeting at the Town Hall, from 6pm this coming Wednesday, 20 September. She will give a five minute speech about the loss of the breastfeeding peer support service in Blackpool. There will be no debate, and no discussion, however there is a public gallery, and it would be wonderful to have that gallery filled with lots of faces of people nodding their approval of the speech. If you would like to attend this please get in touch – we will be meeting outside the Town Hall at about 5.30/ 5.45pm and all are welcome, to show support.